Ever heard of Stanley Middleton? No neither had I until I started reading my way through the list of Man Booker Prize winners. He published more than 40 novels and won the Booker in 1974 with Holiday but you’d be hard pressed to find any of his books on the shelves of your local bookstore. Had it not been for the Booker prize he would simply have faded into obscurity and I would have missed a treat of a novel. 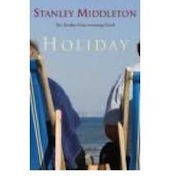 Holiday isn’t one of those books full of action or big dramatic moments. But to dismiss it on the basis that it’s a book in which nothing much happens, is unfair. The action is all inside the head of the main character, Edwin Fisher, a university professor who takes a spur of the moment holiday at the seaside. It’s the same resort he visited year after year as a child when his parents took him for their annual holiday. Recollections of those, not always happy, days mingle with more recent and more bitter memories of his wife from whom he has recently separated. All this is revealed in snatches as Fisher has mooches about on the promenade, sits in full clothing on a beach deckchair watching young girls sun bathing and buying them ice-cream (behaviour that today would render him more than a little suspicious), has some stilted conversations with fellow guests in an old-fashioned B&B and meets his father-in-law a few times when the latter wants to effect a reconciliation between the estranged pair. And then the holiday is over — I won’t spoil this for other readers by explaining what happens to Fisher but just don’t expect any sudden revelations or denouments. Fisher doesn’t come across as a very likeable man initially. He feels superior to his fellow holidaymakers and is contemptuous of his father’s narrow, working class attitudes but we also sense that there is a vulnerability behind the hard exterior he shows to the world. The memories from the past and recollections of his relationship with his wife that occur at different points during his holiday, help him to understand where his marriage went wrong and the changes he needs to make in his behaviour and attitudes in the future. There are many finely observed scenes in this novel. Middleton does a great job of capturing the atmosphere of the type of seaside holiday that was in decline by the 1980s with the advent of the cheap package holiday to Spain. And he does make Fisher more of a sympathetic figure as the novel progresses and we see the complexity of his nature. He struck me as rather a lonely figure for all his bonhomie with fellow guests and how he seemed to be more of an observer of life rather than a participant. A well observed study of character and reflections on love, marriage and death told in a style that doesn’t contain many flourishes but has the strength of authenticity. According to some articles written on his death in 2009, Holiday was not actually his best work so I’ll look forward to reading other books by him if I can track them down.